Get ready for some incredibly unexpected, but possibly amazing news, sci-fi fans. Quentin Tarantino, the man behind movies like Pulp Fiction and Kill Bill, is making a Star Trek Movie with J.J. Abrams, the man responsible for the most recent reboot of the beloved franchise. Reportedly, Tarantino came up with a great idea for a new Star Trek movie and Paramount is getting behind it in a big way. What's more is that, if things go well, Tarantino will direct this new Star Trek movie. Here's what Deadline has to say about it. "Sources said that Tarantino has come up with a great idea for a Star Trek movie at Paramount. After sharing his idea with J.J. Abrams (who himself is busy prepping Star Wars Episode IX), I've heard the plan is to assemble a writers room of scribes who'll hear Tarantino's take and begin to put together a movie. If it all works out, Tarantino might direct it, with Abrams producing." This sounds like it is in the very early stages of development, but it's no less fascinating. Quentin Tarantino has famously made his own movies, his own way. He's never tackled a franchise before and never seemed like the kind of guy that would. 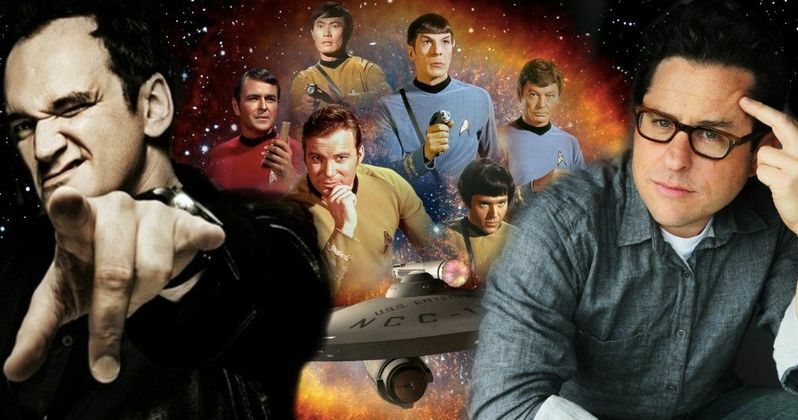 However, he's expressed his love for Star Trek in the past and has teased that he would consider doing a Star Trek movie, under the right set of circumstances. On an episode of The Nerdist Podcast from late 2015, he teased a little bit of what a Tarantino Star Trek movie could look like. "I would be more inclined to do a Star Trek kind of thing rather than Star Wars. I haven't considered considered it, like I'm going to do it, but I did web spin a little bit about the idea...The obvious one would be The City on the Edge of Forever. That's what everyone would go to, but there's a reason why everyone would go to that! It's one of the classic stories of all time. And one of the great time travel stories." At the moment, there are no firm details available on this Star Trek movie story that Quentin Tarantino pitched to J.J. Abrams, so it's impossible to say whether or not this will have anything to do with The City on the Edge of Forever, which is generally considered to be one of the greatest Star Trek episodes ever produced. In any case, Paramount is willing to assemble an entire team of writers to put together this movie and they're going to pair up J.J. Abrams and Tarantino to make it happen, bare minimum as very involved producers. Not only is that something nobody ever could have guessed would happen, but it's an absolute powerhouse combination of Hollywood talent tackling one of the most enduring franchises in history. Quentin Tarantino is currently working on his new movie, known only as #9, for Sony and J.J. Abrams is busy prepping Star Wars: Episode IX. However, the time it takes both filmmakers to complete those projects will give Paramount the time they need to get this mystery Star Trek movie written and ready. The timing could work out perfectly. This movie does raise a lot of questions though. Will it replace Star Trek 4? Will it happen in addition to the proposed follow-up to Star Trek Beyond? Will it serve as a total reboot of the franchise? Will it just be a standalone Star Trek movie? There's a lot to think about and Deadline, unfortunately, doesn't have much else to offer in the way of details at this time. In any case, if Tarantino is good on his word and retires from directing after making ten movies, his final movie could be a Star Trek movie. We'll be sure to keep you posted as more details on this new Star Trek movie are made available.